Tue, 8 May 2018 14:46 . Hits: 152x. UNUJA AC.ID - UNUJA has established cooperation with Universiti Malaysia Sabah (UMS) in a student exchange program. 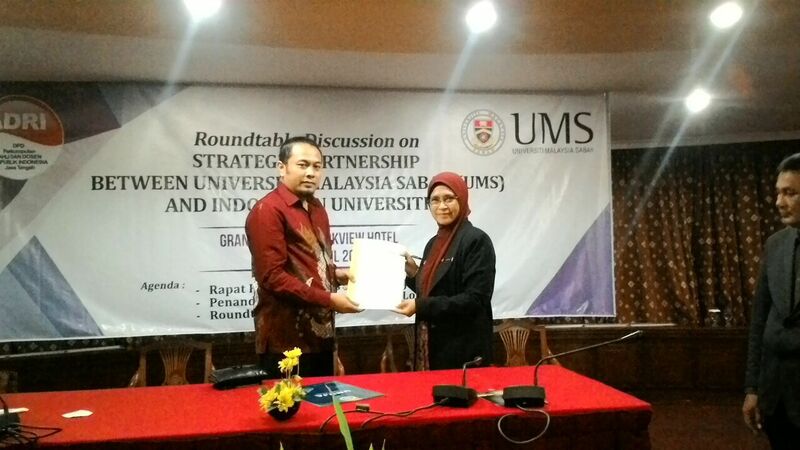 The agreement on the program was officially signed on Thursday, April 26, 2018 in Semarang, at the Roundtable Discussion on Strategic Partnership Between Universiti Malaysia Sabah (UMS) and Indonesian Universities. This was organised by the Association of Experts and Lecturers of the Republic of Indonesia (ADRI ) and UMS. Located at Grand Arkenso Park View Hotel, Semarang, the Letter of Intent (LoI) between UMS and UNUJA was signed by Prof. Ir. Dr. Arsiah Bahron (Dean of the Centre for Post-Graduate Studies, UMS) and Vice Rector IV UNUJA for Cooperation Affairs, KH. Faiz, M.Fil.I. Tue, 8 May 2018 14:14 .